We had an early breakfast in the small dining room. There wasn’t as much variety as other places, but everything we need. We walked a bit around the neighbourhood before joining the group for the city tour. The early morning streets are not too interesting, with roll-down shutters over every store front. When Wilson met us, Lynn still didn’t feel up to touring, so the other 8 of us went off and let her rest. We had a really great tour of the Homero Ortega Panama Hat factory. 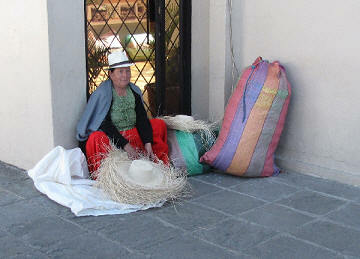 The hats are hand-woven at home by individuals, mainly out in the countryside. They bring huge batches of them to the factory, where they are selected by quality. Then the many following processes take them into and out of the factory a few more times until there is a finished product. I think only 3 hats were bought by our group but several of us got handbags and jewelery. I got a nice brown bag and earrings. After a drive along the river and past several points of interest, such as Inca terraces and a museum we must go back to, we got out to walk near the main square. It is lovely, with old and new cathedrals on each side and many large trees, paths, flowers, statue, benches and so on in the middle. We went into the huge and extravagant new cathedral and sat while Wilson pointed out the way the images meld the local traditions with Christian symbols and stories. Then we walked to an amazing flower market and enjoyed its sights, sounds and smells for awhile. We tried a drink prepared by the Carmelite nuns, but none of us liked it much. By then it was after 1 pm and we were ready to look for a restaurant. Wilson found us a nice one and went on his way. After lunch Brock, Elsie, Larry and I went in search of ice cream and then back to the hotel for some quiet time. The altitude here is about 2500 metres above sea level. It’s enough that we notice some breathlessness and we tire more quickly than usual. At least that’s our story and we’ll stick to it.